From The Era of 18 June, 1930. 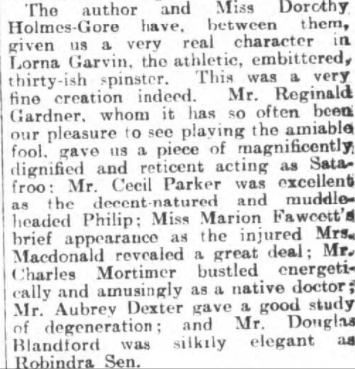 The author and Miss Dorothy Holmes-Gore have, between them, given very real character in Lorna Garvin, the athletic, embittered, thirty-ish spinster. This was very fine creation indeed. Mr. Reginald Gardner, whom it has so often been our pleasure to see playing the amiable fool, gave us a piece of magnificently dignified and reticent acting as Satafroo: Mr. Cecil Parker was excellent as the decent-natured and muddleheaded Philip; Miss Marion Fawcett's brief appearance as the injured Mrs Macdonald revealed a great deal; Mr Charles Mortimer bustled energetically and amusingly as a native doctor! 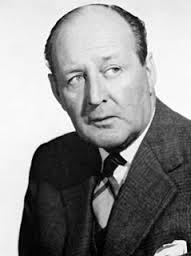 Mr. Aubrey Dexter gave good study of degeneration; and Mr. Douglas Blandford was silkily elegant its Robindra Sen.
Charles Mortimer played Dr Sanyal in "Who Knows", at the Strand Theatre, London, on 15 May, 1930. 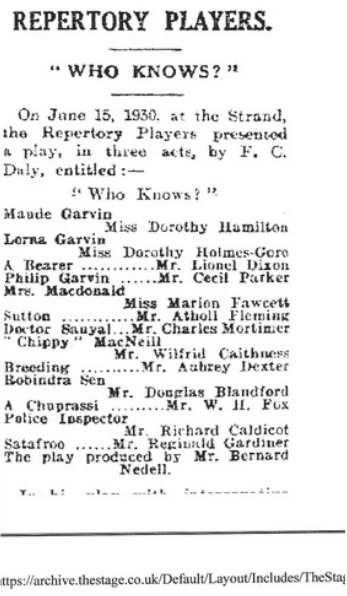 The play included in its cast, Cecil Parker. The Stage commented that the play was about aspects of life in India, and was played skilfully and was well received.